The Boss BF-3 builds on the outstanding legacy left by its predecessor the BF-2, by giving both guitarists and bassists elaborate flanger control with an easy to use and intuitive layout. As we've come to expect from the team at Boss, the stompbox casing and enclosure is built as solidly as they come, the controls respond smoothly and precisely, and it is proportioned to slot into any pedalboard with ease. As well as the classic Boss flanger effect, there are two additional modes: Ultra and Gate/Pan, which enable flange effects to be created with exceptional depth, slicer-type effects, and elaborate swirling sounds. Thanks to the stereo outputs, you can create a greater three-dimensional image to produce a truly enveloping sound. As well as the footswitch, there is a range of controls across the front panel, including: RES, Manual, Depth, Rate, and Mode Select. The RES knob controls the amount of resonance (feedback), the more the knob is turned clockwise, the greater the flanger sound is emphasised, and the greater the power of the effect. The Manual knob adjust the centre frequency focus of the effect, as the control is turned clockwise, the more that range is raised - this range varies depending on whether an electric guitar or a bass is connected to the pedal. The Depth knob adjust the depth of the sweep, taking you anywhere from a subtle swishing to an all-powerful swirling effect. The Rate knob adjusts the flanging rate, giving you the ability to take the effect from a gentle undulation to a pulsating force. The tempo can also be set by pressing and holding the footswitch for more than 2 seconds, wait for the red/green blinking light and press the pedal switch in time with the tempo. To switch it off again, simply hold the pedal down for at least two seconds. Easy! There are four modes available to choose from: Standard, Ultra, Gate/Pan, and Momentary. The Standard setting provides a lush flanging effect, whilst the Ultra effect delivers a much stronger flanger effect. The Gate/Pan setting allows you to creates aurally striking changes in the output volume when using the mono output. When playing via the stereo output, this setting alternately pans the output between the left and right outputs, resulting in a rotary effect. The Momentary effect is only applied while the footswitch is depressed, allowing you precisely activate/deactivate the flanger effect. 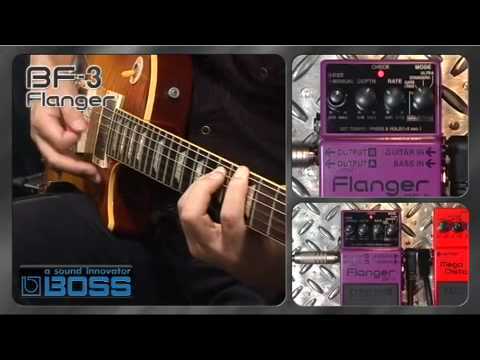 As previously stated, the BF-3 is designed for use with both guitar and bass, and the flanger response will adapt accordingly, based upon the instrument that is plugged in. If you’re looking for an affordable flanger that delivers exceptional results, then look no further than the excellent Boss BF-3 Flanger Guitar Effect Pedal.